Barack Obama swept to a convincing victory in the North Carolina primary Tuesday night and declared he was closing in on the Democratic presidential nomination. Hillary Rodham Clinton eked out a win in Indiana as she struggled to halt her rival's march into history. Clinton pulled off an Indiana win in what was a virtual must-win Midwestern state, but her margin of victory was small. With 100 percent of the votes in, she beat Obama 51 percent to 49 percent. "Hillary Clinton may have gotten what she needed to keep her uphill quest for the Democratic nomination alive - but by the barest of margins," said CBSNews.com senior political editor Vaughn Ververs. "She is now running out of both the time and chances she needs to stay alive." "And thanks to you, it's full speed to the White House," she said to the cheering crowd. CBS News chief political consultant Marc Ambinder reports Clinton will talk with her campaign brain trust on Wednesday to decide what to do next. The New York senator had originally planned on staying behind closed doors for the day Wednesday, but her campaign announced in the morning that she will hold a town hall meeting on the economy in West Virginia - the site of the next Democratic contest on Tuesday. A campaign aide also said Wednesday morning that Clinton loaned herself $6.4 million in the past month. She gave her campaign $5 million earlier this year. Obama's North Carolina victory mirrored earlier triumphs in Southern states with large black populations: Georgia, Alabama, Louisiana and South Carolina among them. 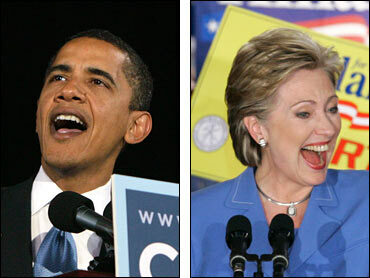 With 100 percent of the votes in North Carolina being reported, Obama defeated Clinton 56 percent to 42 percent. At the Raleigh rally, Obama struck a conciliatory tone by acknowledging Clinton's Indiana win. "I want to start by congratulating Senator Clinton on what appears to be her victory in the great state of Indiana," he said. Obama went on to tout his North Carolina victory as a win in a "big state, in a swing state," and vowed to compete to win it in the general election. CBS News exit poll results show that most voters in both states made up their minds a while ago. Only 18 percent in Indiana and 14 percent in North Carolina decided in the last three days. Twenty-five percent in Indiana and 20 percent in North Carolina decided in the last week. Late deciders backed Clinton in Indiana by a margin of 59 percent to 41 percent for Obama. In North Carolina, Obama won late deciders by a much smaller margin of 49 percent to 48 percent. "The most intriguing story about the Democratic primaries in Indiana and North Carolina … is actually about non-Democrats - Independents and Republicans," said CBS News political consultant Monika McDermott. Clinton received the support of 60 percent of white voters in both states, while Obama got 40 percent of the white vote in Indiana and 36 percent in North Carolina. Obama won the overwhelming majority of black voters: 92 percent in Indiana and 91 percent in North Carolina. As it has been throughout the Democratic primaries, the economy was the most important issue in both states, with 67 percent of voters in Indiana describing it as such and 61 percent in North Carolina. In Indiana, 49 percent of voters said Clinton would be more likely to improve the economy and 47 percent said that Obama would. In North Carolina, 53 percent said that Obama would be more likely to improve the economy and 42 percent said that Clinton would. Voters were split about the effect of Obama's former pastor Reverend Wright on their vote. In Indiana, 46 percent said that it was important and 51 percent said that it was not, while in North Carolina, 47 percent said the Wright situation was important in their vote and 51 percent said that it was not. In both states, more voters thought that Clinton attacked Obama unfairly than vice-versa. Sixty-four percent of Indiana voters and 67 percent of North Carolina voters thought Clinton attacked her opponent unfairly, while only 44 percent in Indiana and 40 percent in North Carolina thought that Obama unfairly attacked Clinton. Looking ahead to the general election, CBS News exit polling showed that the majority of voters said that they would not be satisfied if the Democratic candidate they did not support were to become the nominee. Only 35 percent of Clinton voters in Indiana and 34 percent in North Carolina said they would be satisfied with Obama. Forty percent of Obama voters in Indiana and 45 percent in North Carolina would be satisfied if Clinton becomes the Democratic nominee. Obama was seen as the candidate with the best chance at beating presumptive Republican nominee John McCain in the general election. Forty-seven percent of voters in Indiana thought that Clinton could beat McCain, while 50 percent thought that Obama could win in November. In North Carolina, 39 percent thought that Clinton could beat McCain and 55 percent thought that Obama could beat the Arizona senator. Obama had 1,844 delegates to 1,688 for Clinton in the latest CBS News delegate count. 2,025 are needed for the party's nomination. In Indiana, Clinton was leading Obama with 38 delegates to Obama's 34. In North Carolina, Obama was ahead 65 to 47. Both races were dominated in the final days by Clinton's call for a summertime suspension of the federal gasoline tax, an issue that she created after scoring a victory in the Pennsylvania primary two weeks ago. Obama ridiculed the proposal as a stunt that would cost jobs, not the break for consumers she claimed. The two rivals dug in, devoting personal campaign time and television commercials to the issue. Indiana had 72 delegates at stake, and Clinton projected confidence about the results by arranging a primary-night appearance in Indianapolis. North Carolina had 115 delegates at stake, and Obama countered with a rally in Raleigh. Clinton saved her candidacy with her win in Pennsylvania, and she campaigned aggressively in Indiana in hopes of denying Obama a victory next door to his home state of Illinois. Indiana is home to large numbers of blue-collar workers who have been attracted to the former first lady, and she sought to use her call for a federal gas tax holiday to draw them and other economically pinched voters closer. Inevitably, the issue quickly took on larger dimensions. Obama said it symbolized a candidacy consisting of "phony ideas, calculated to win elections instead of actually solving problems." Clinton retorted, "Instead of attacking the problem, he's attacking my solutions," and ran an ad in the campaign's final hours that said she "gets it." To a large extent, the gasoline tax eclipsed the controversy surrounding Obama's former pastor. After saying several weeks earlier he could not disown the Rev. Jeremiah Wright for his fiery sermons, Obama did precisely that when the minister embarked on a media tour. At a news conference in North Carolina last week, Obama equated Wright's comments with "giving comfort to those who prey on hate." The balance of the primary schedule includes West Virginia, with 28 delegates on May 13; Oregon with 52 and Kentucky with 51 a week later; Puerto Rico with 55 delegates on June 1, and Montana with 16 and South Dakota with 15 on June 3. With the Republican nomination virtually in hand, McCain campaigned in North Carolina and assailed Obama for his vote against confirmation of Chief Justice John Roberts. "Senator Obama in particular likes to talk up his background as a lecturer on law, and also as someone who can work across the aisle to get things done," McCain said. "But ... he went right along with the partisan crowd, and was among the 22 senators to vote against this highly qualified nominee." Clinton also voted against Roberts, but McCain, as if often the case, focused his remarks on Obama. Obama's campaign responded that the Republican would pick judges who represent a threat to abortion rights and to McCain's own legislation to limit the role of money in political campaigns.